I just returned from a week away, but I snapped these pics before I left so I could show off my garden, in case anyone asked. No one did, but now I get to share them with all of you! Bok choi is an amazing plant. It cannot be stopped. It just wants to grow, and get to the part about making flowers and seeds. They really embraced this strange, grow-in-a-bale-of-straw lifestyle. For a little while before my departure, we juiced bok choi with apples, carrots and lemon, and made stir fry (yum). Several years ago, when we were daily bathing our cells in phytonutrients, we would make a half gallon of fresh veggie juice every morning with these ingredients, and drink it throughout the day. It really is refreshing and delicious and so good for you. (If you want more info about juicing, check out www.juicefeasting.com). 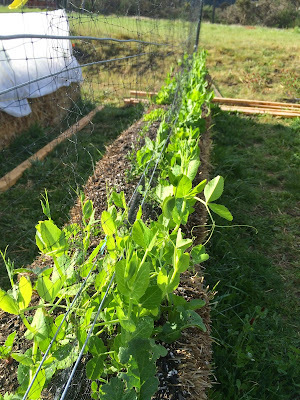 Moving right along, we have the row of peas, which finally seem to be taking off, though no flowers yet. 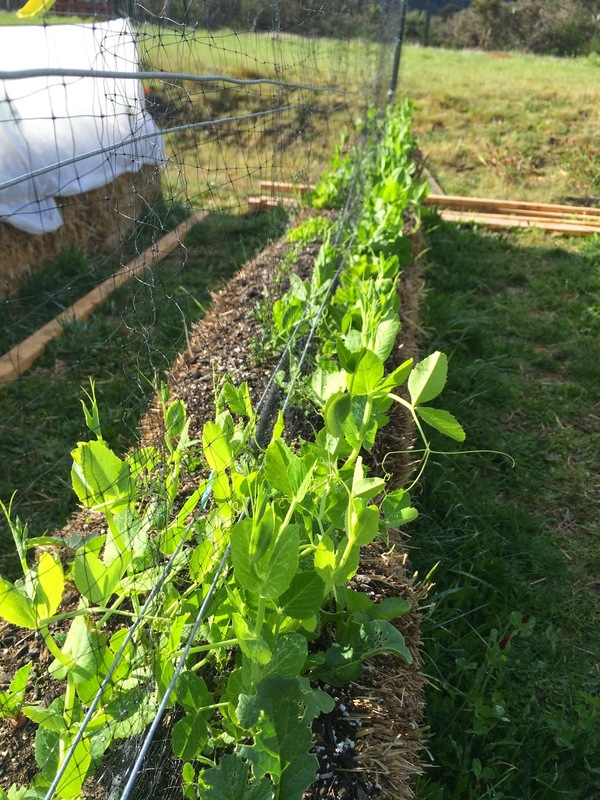 This row also has arugula, radishes, spinach, and lettuce, planted underneath the peas. I don't think the nitrogen had mellowed enough for the radishes because when I pulled them up yesterday, they had 4-10 rootlets, and were not one nice round ball. This often happens with carrots if they have too much N as well. Note to self: bales are maybe not for root crops? The book says it's fine, but I'm not so sure. Next we come to lettuce, looking very nice. We enjoyed our first head as a salad on the night I returned home, and there's a lot more out there. 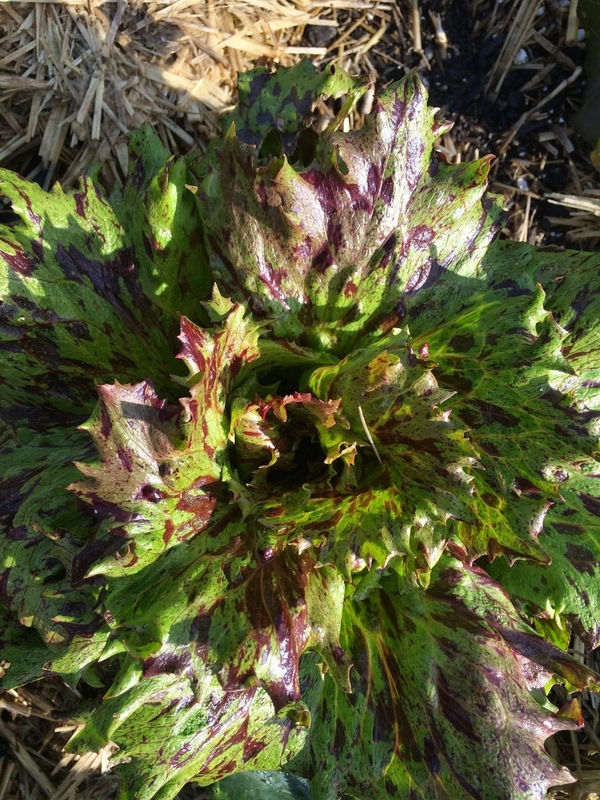 We are finding, again, that lettuce does prefer the overhead watering, so we might get a few misters to water these babies, to keep them luscious and un-leathery, as well as un-bitter. In any event, home-grown lettuce is always far better than store-bought, and we have gone too long without it. Lastly, here is the next round of bales! In addition to these, there are three more next to the pea row. Most of these are going to be for tomatoes, and other summer crops. They are almost ready. I messed up a bit when I planted my tomatoes too early this year. I used to plant in February, until I realized that the ground was never ready early enough for the February starts. Better to plant at the March new moon. But being a little out of practice, since we skipped a lot of gardening last summer, I forgot this very important detail. Our tomato plants have been ready to get out of pots for several weeks already, but the bales are only now just barely ready. Learn and forget, learn and forget. Sooner or later, we'll be experts, but not yet!